Solar panel and solar power are among the hottest topics in social media right now. However, the majority of people think that they are very expensive. 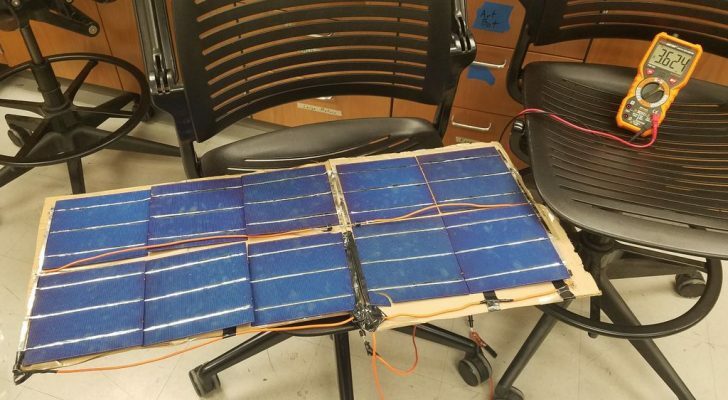 Instructables’ user BrotherJames8765 doesn’t think so, he built a solar panel for less than $30. It doesn’t include all the downstream gizmos of the panel’s output such as regulators, inverters, energy storage methods, etc. To be honest with you, you won’t be able to use this panel to power pretty much anything at your home. It produces around 5 Vdc at 72 mW on an overcast day. The point of this guide is to learn about basic solar panel design. He bought everything from eBay. His solar panel includes 10 solar cells, and you can buy them on eBay for as low as $1.3 per piece. 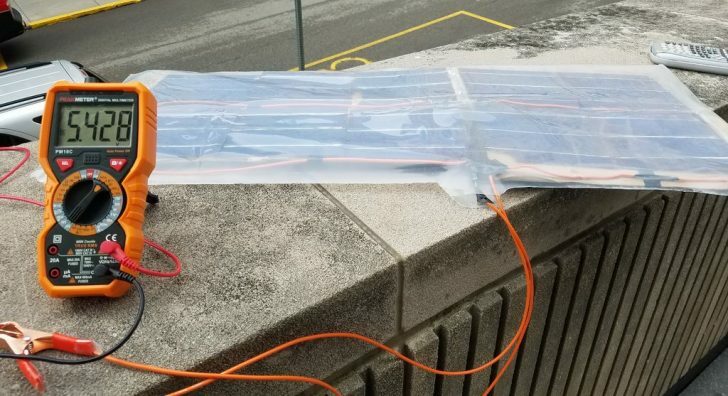 Other details are a solar tab and bus wire($3), test lead clips ($2), 14 gauge wire (less than $1), diodes (less than $1), plastic film ($2), and zip ties ($2). There are some other materials which you can find in his guide. The first part was to connect the cells. But, there was one problem: when shade drapes across one cell, the cell acts as an open circuit and cuts power from the entire solar panel. He solved it by adding ‘bypass’ diodes. 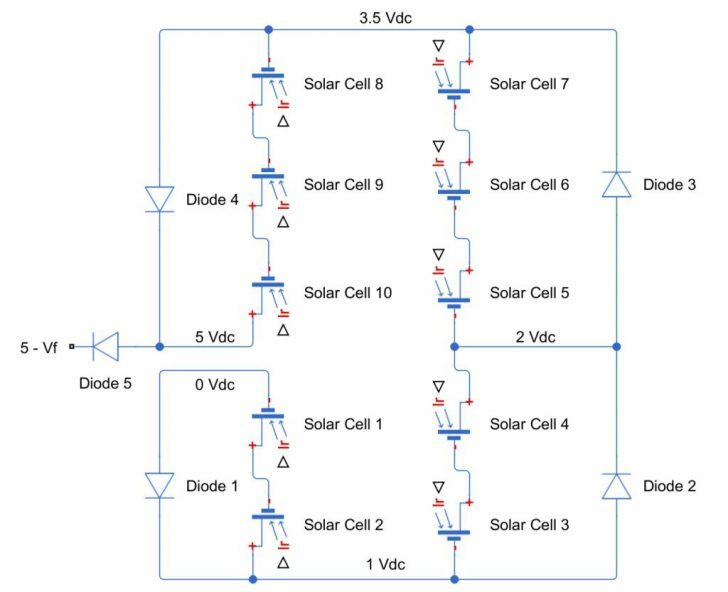 They are diodes oriented in parallel with the solar cells that enable current to flow around a particular chain of cells when it becomes shaded. Another problem was that when it’s dark outside, solar cells can actually sink current, acting as a resistor. He included a blocking diode in front of the circuit to ensure that the panel never acts as a power drain. The most difficult part of the process is the soldering of the cells. They are very fragile, and you will need a lot of practice in order to learn that. The author included a lot of useful tips on how to do soldering properly. The next step was to solder the bus wire. It was also hard since the bus wire is very close to the fragile solar cells. After this, you should have a fully functioning solar panel. The only thing left is to add in the test lead clips and diodes. Test lead clips should be soldered onto the panel’s terminals. He used two segments of wire ( length doesn’t matter) to place them between the test lead clips’ tabs and then soldered it, permanently securing the connection. Then, he soldered the diode directly to the bus wire and then used the 14 gauge wire to connect another end to the next bus. He also advises that each time you solder a bypass diode, you should test it with a multimeter. Now you have a working solar panel that cost you around $30. Additionally, you can secure cells to the backing material and add plastic covering. It will make the solar panel waterproofed, but do not expect a perfect result. Very interesting article, I really appreciate the author who collected all the interesting fact regarding this. I didn’t know that you could solar panels at home but after reading this article I know now. Nicely described all the details regarding the Solar Panel That You Can Make at Home For $30.